Colchester is unusual, and perhaps unique in England, because for a town of 150,000+ people it has no large central church. There were nine small medieval parishes, each with its own small church, but none as big as Ipswich's St Mary le Tower, or Norwich's St Peter Mancroft, or Cambridge's St Mary the Great. 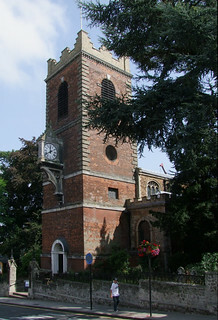 They suffered two depredations that churches nowhere else in England had to suffer - most were ruined during the 1648 Seige of Colchester (being the only fortified buildings in town, the Royalists holed up in them and they were attacked by the Parliamentarians) and then the earthquake of 1884, after which two of them were demolished. One of the survivors, St Peter, is now designated the 'town centre parish'. Open. The tower and the interior date from the 18th century. It looks beautiful on its site at the top of North Hill, but what a gloomy, sad interior this is! Entirely restored late 18th Century. Galleries run down both aisles, and anything of medieval interest has been removed. If I had to worship in this church every Sunday I would think that God was a very dry, dusty fellow.